A new paper just published in Cell Reports describes, for the first time, a novel pathological mechanism that may contribute to a variety of disease states. Within the cells of our body, many of the proteins and lipids are produced by a structure within a cell called the endoplasmic reticulum (ER). The ER also serves as the cell’s primary reservoir of calcium. Within the ER are proteins that carry out the production and growth of proteins and lipids sent to the body for a myriad of healthy uses. Each of the resident ER proteins are kept in the ER by tail sequence called an ER retention sequence (ERS). If a protein escapes the ER, its tail is recognized by a receptor called a “KDEL receptor” and returned to the ER. This function is critical to the maintenance of a healthy body. Scientists at NIDA’s Intramural Research Program have published a study showing that when the calcium levels drop in the ER, the cell proteins overwhelm this retrieval mechanism and redistribute to the outside of the cell. This causes both a loss of their function in the ER as well as unwanted expression outside the cell which may contribute to a variety of disease pathologies related to the depletion of ER calcium, such as diabetes, stroke, Alzheimer’s, cardiac diseases and substance use disorders. 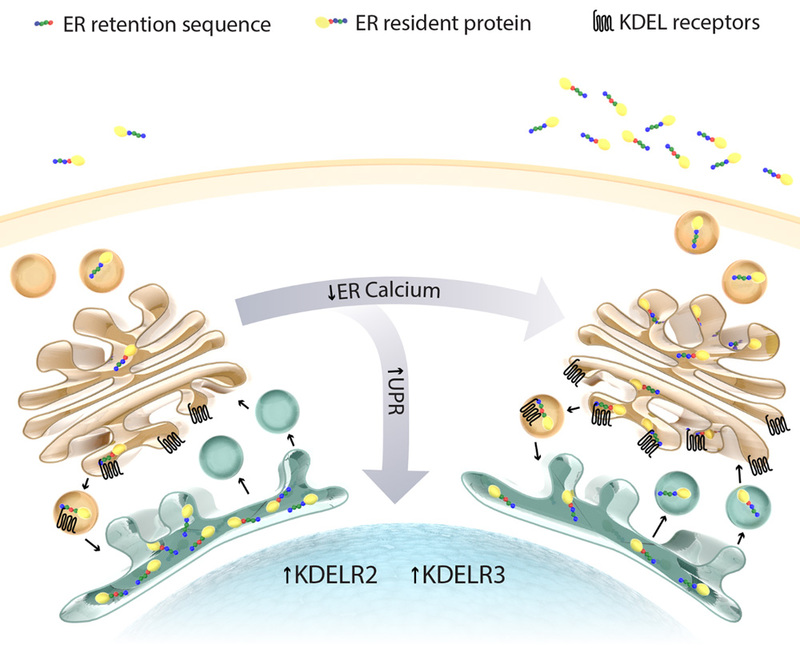 This greater understanding of the most delicate mechanisms in the body suggests that stabilizing ER calcium or increasing KDEL receptors has therapeutic potential.